This is the new Rangers 10/11 Away Kit, made by Umbro. The away strip that the Gers will wear during the 2010/11 season bears a great resemblance to Atletico Madrid’s home kit. This red and white striped shirt was worn by Rangers for the first time in their pre-season friendly against Queen of the South. The shirt has a red collar and the shorts are blue with red trim. 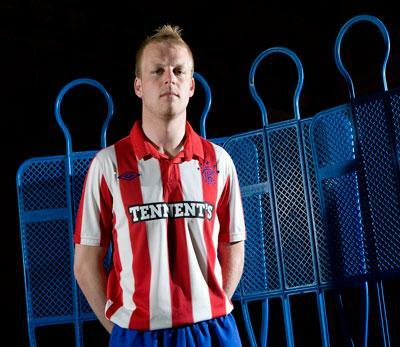 Tennents are the sponsors of this Rangers 10/11 away strip. This entry was posted in SPFL/Scottish Premiership and tagged Glasgow Rangers, Umbro on July 19, 2010 by Football Kit News. nice !! glasgow rangers champions !!! Thats looks like Atletico shirts.